Yellow Pine Tree For Sale - Delivered Fast To You! The Yellow Pine Tree, a coniferous evergreen produces needles that are a pretty yellow color. Its scientific name is Pinus rigida. The tree grows well in the hardiness zone of 4 allowing it to become well in the forests of the northeastern United States. It is also known as the Pitch Pine, named for the resinous sap that oozes out of its wounds. 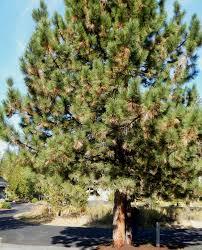 The Yellow Pine Tree is a slow-growing plant that adds two feet per year to its height. The pine needles are long and slightly twisted averaging 3 to 5 inches in length. The color of the needles ranges from yellowish green to green. Each pine tree produces male and female flowers. The tree bark is grayish-brown and forms into plates that shed. At maturity, the bark could be up to 4 inches thick. The wood from the Yellow-pine tree has a yellowish tint, which is where the name of the tree was originated. The Yellow Pine Tree male flowers are yellow clusters that only produce pollen. The female flowers turn into prickly ovoid cones that house a seed in each scale. The cones grow to be 2 to 4 inches long. Its pine cones can remain on the tree for years.The tree forms an open, airy canopy in a pyramid shape sitting on top of a long trunk. It can grow to be as tall as 90 to 180 feet and 50 feet wide when it reaches maturity. The best way to propagate the Yellow Pine Tree is with seedlings. It prefers moist, humid conditions, but can thrive in drier settings. It grows well in sandy or gravelly soil, and it like acidic soils that are moist and well drained. The Yellow Pine Tree requires full sun. If using them for landscaping plant the seedlings in an open area. These are magnificent trees for defining property lines, and it is a beautiful plant to mark the growth of your family by. If planted 4 to 5 feet apart they will determine your property boundaries beautifully. This tree is a medium size pine that is loved by many. The yellow pine is a great tree that will be great for shade in just a few years. In about two to3 years this tree will be able to look full grown. The bark will be a red-brown which will look great on your lawn.